Three fun felt pets I found in my garden...Slimy Snail, Crawling Chameleon and Tranquil Turtle. These little critters make perfect pocket pals, to take on all of your adventures. 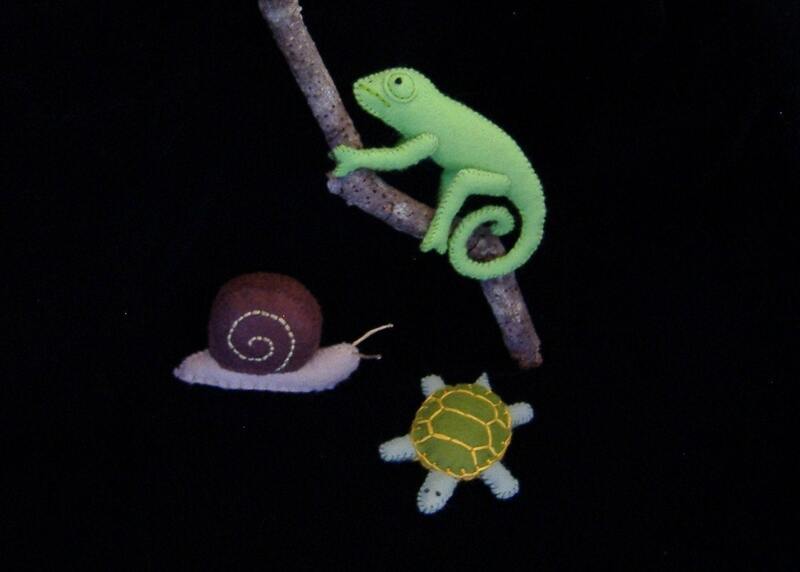 Chameleon when finished, measures approx 4", Turtle is about 3" from nose to tail, and Snail is approx 3" long. This listing is for PDF patterns and instructions only. Not the finished product. Pattern will be emailed within 24 hours of cleared payment. Great patterns and easy to follow instructions. Thank you! Shipped ahead of time. Pattern very explicit. Just what I was looking for. My boys really enjoyed making this pattern- it is simple for beginners and makes a super fun toy! Just a lovely, easy little pattern with excellent instructions. Thankyou.